In the past you have enjoyed staying with us on our beautiful farm, and we have enjoyed welcoming you here. In order to thank you for your much appreciated visits and to make future stays more enjoyable, we are able to announce to you some exciting news! Together with the support of some of the other great guest destinations and/or service providers in Tulbagh, we are now in the position to offer you, as our valued guest, the following vouchers! 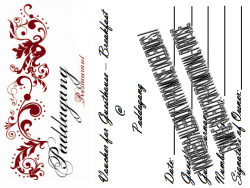 Paddagang Voucher for a Guesthouse Breakfast! Why get up and slave in front of the stove if you can have a lazy short drive to Tulbagh and enjoy this delicious Breakfast at the world wide known Paddagang? This treat is a MUST! Kuierbossie 15% off Meal Voucher! This is the ideal stop while you are exploring the beautiful Tulbagh valley. Kuierbossie is exactly the kind of place the name indicates..., a place to sit down and “kuier” to your heart’s content over a hearty plate of good food! Kuierbossie also has some of the best wines of our area at very reasonable prices, just to ensure that there is more than enough inspiration to your “kuier”! Salon Walni Voucher with 20% & 10% off on a treat! This voucher we offer especially to our guests who stay over for an event. Salon Walni offers you a 20% reduction on a Wash & Blow/Set to get you looking your best, ready for that party or wedding reception. If however you just wish to pamper yourself, Salon Walni offers a 10% reduction on any of their other services:- Hair Treatments, Gel Nails, Energizing ionic Detox Machine, Manicures, Pedicures, Facials & Permanent Make-Up. Be sure to book yourself in to be pampered while you stay with us.